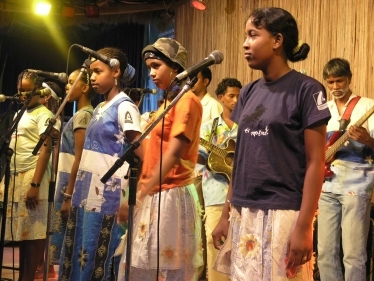 January 2005, the Community Vilaj incorporated three dynamic components intended to advance local sustainable development in Small Island Developing States (SIDS). These components are: The Community Vilaj Dialogue Space, The Institute@SIDS, and The Island Resilience Technologies Fair. Day one at the Community Vilaj began with the registration of community participants and a special "Making Connections" process, which brought together and introduced all participants and facilitators. Please click here to see photos from Day One.After the introductions, Jane Cook from Papua New Guinea proceeded with a traditional blessing of the space. This moving ceremony touched on the importance of local knowledge and experience and provided an opportunity for reflection and contemplation at the beginning of what will be a hectic and very exciting 8 days at the Community Vilaj. Saturday, the 8th of January, was scheduled for field visits to the l'Aventure du Sucre Museum and the CODEPA project. There was anticipation in the air as community members met at the St. Georges Hotel at 8:30 am for the trip to l'Aventure du Sucre. 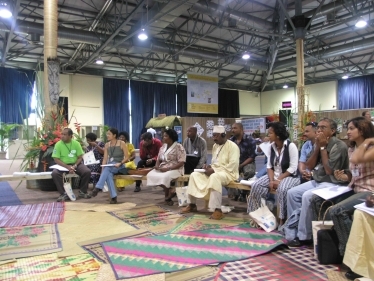 During the visit to this exciting showcase of Mauritian economic and social history, community participants took in a spectacular exhibition on the story of sugar in Mauritius. Photos from the field visit can be found in the daily Photo Diary. 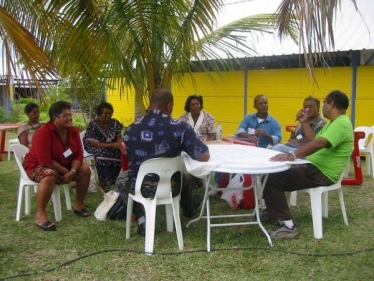 Day Four at the Community Vilaj coincided with the opening day of the official SIDS Mauritius 2005 meeting. 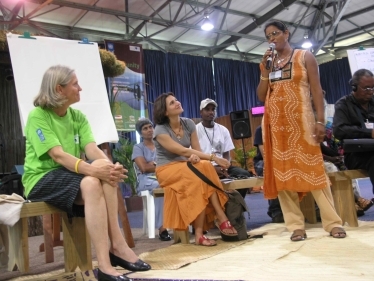 During the morning session at the Vilaj, participants traveled to the Swami Vivekanada Convention Centre in Les Pailles to register for the Official Conference and its side events. The participants were met at Les Pailles by Diane Quarless, of the United Nation's Department of Economic and Social Affairs (DESA), for an informational overview of the conference agenda and protocol. 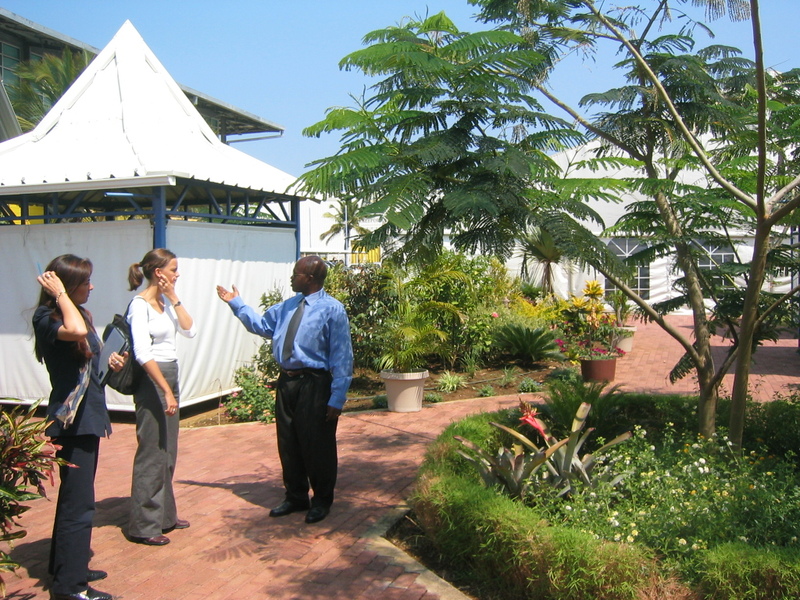 Following this briefing, the participants were given a fascinating tour of the main conference venue. Full photographic coverage of Day Four, including images from the main conference site can be seen in the Community Vilaj Photo Dairy. Day Seven of the Community Vilaj truly lived up to the dialogue space's mission statement of "Local Voices œ Global Impact”. 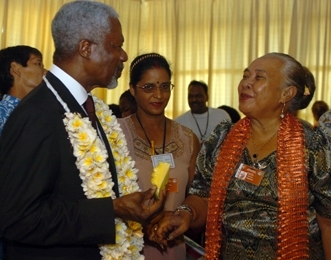 The day saw UN Secretary-General, Kofi Annan, and Mrs. Annan visit the Vilaj and spend one and a half hours speaking with participants about the issues most important to them. The Secretary-General heard how the community participants, and countless other communities around the globe, are working to build resilience and develop effective strategies for coping with, and mitigating, risk and disaster. Full coverage of the Secretary-General’s visit to the Community Vilaj can be found in the daily Photo Diary and in a short Film on his remarks.